When we tell people we are staring a zine collection in the Vassar Library, we usually see one of two reactions, excitement or confusion: excitement over the potential this amazing format has to offer our community, but confusion, because many don’t really know what a zine is. Learn more about our zine collection and how you can help contribute to it! Zines are a DIY, self-published medium, incorporating voices and narratives frequently absent from more traditional publishing venues, with “zine” pronounced like “magazine” (without the “maga” part, as Alex Wrekk succinctly instructs us in Stolen Sharpie Revolution). Why are you starting a collection at the library? We feel that zines are one venue through which our community can express itself. 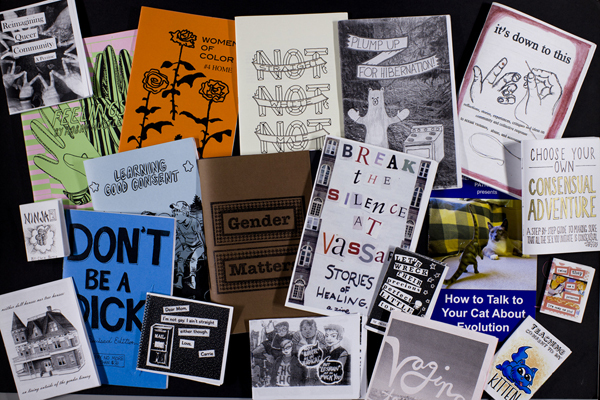 With the college having opened up many lines of dialogue on campus in the past few years, the library thought that zines might offer another way for some to voice their thoughts and feelings. Not everyone wants to speak in front of a crowd; many prefer or simply enjoy the medium of writing and drawing and creating. Right now, we are in the early stages of planning the space and the collection, but we always welcome donations from the community! Please contact zines@vassar.edu if you have a zine you would like us to add to our zine library. Currently the collection resides in a librarian’s office, but we are working on developing a public home for the zines in the main library. In the meantime, if you want to help us get our collection started, please join us in the Collaboratory from April 21-26. What will you do with the zines? So what’s up with the Collaboratory? The Collaboratory is Vassar’s Creative Arts Across Disciplines trailer, which is currently parked on the quad outside of Rocky. (You can learn more about the program in this Misc article, and check out their inspirational student-curated page here.) During the week of April 21-26, the Zine Library team will be hosting a zine-creating event which will open its doors to the public daily, inviting everyone and anyone to drop in and create. Your zine can be one page or many, small or large, singular or the beginning of a collection! Come draw, write, design, or do a little bit of everything. Ask us if you’d like ideas and inspiration. We would love to help you get started! Glad you asked! Please look to libguides.vassar.edu/zines as we continue to update the space with information and connections. In the spirit of zines, we welcome collaboration and input. This entry was posted in collection highlights by heberthoud. Bookmark the permalink. I am not a member of the Vassar community, but I am interested in participating in the project. Not sure if outsiders are welcome. Thank you for your interest in this event! We’ll be open to the public for the weekend (April 25-26), and hope to see you then. Also, if you are interested in potentially donating your zine, please view the information about our collection available on our zines page.